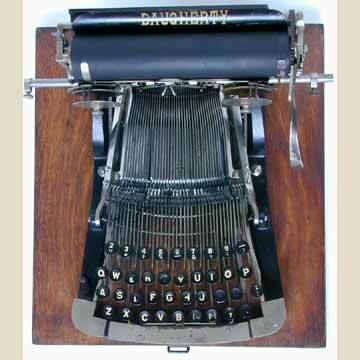 James â€œDocâ€� Daugherty of Pennsylvania makes claim to the title of inventor of the first truly modern visible writing typewriter, which he marketed in 1891. .
With four rows of keys and typebars that swing up to hit the platen on the front, the Daugherty is fundamentally the same as the manual typewriters that are still in use today. The biggest problem about the Daugherty was the lousy alignment of the type. The typearms were relatively long and tended to swagger on their long way up to the platen. Also see â€œTypewriterâ€�, page 106.